Selected Rings, Pendants and Talismans made available to Gemstoneuniverse.com patrons in May 2011. Comments Ketu is also known as the south node! 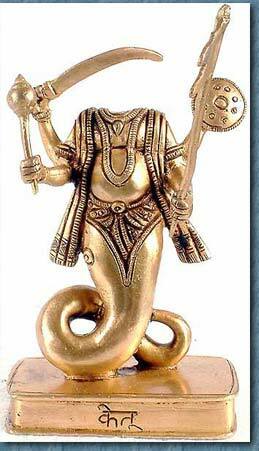 When Lord Vishnu, beheaded the asura during the churning of the ocean to obtain nectar, the head became Rahu and the body became Ketu! This head less planet is known as Moksha Karaka or the planet that can bring about salvation! Ketu is known to give problems to attain salvation! 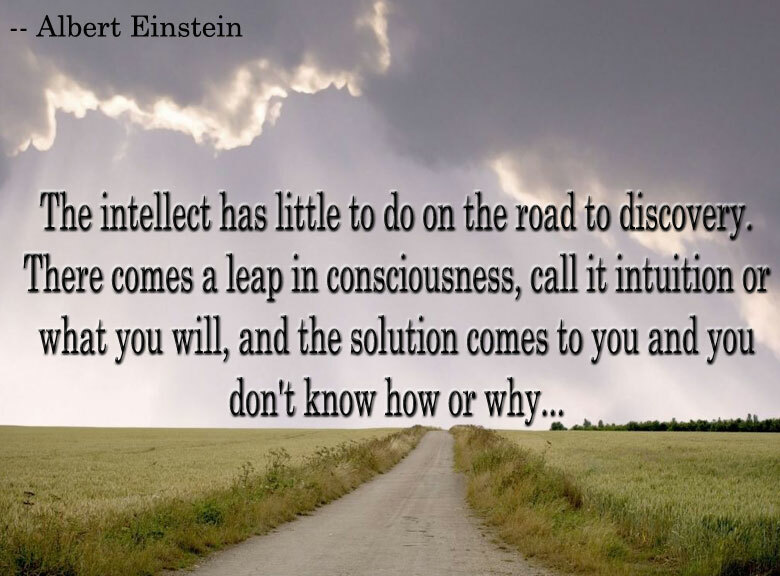 Ketu gives an individual spiritual knowledge and also wisdom and non-attachment! Ketu is also known to give psychic abilities to individuals! Also known as the planet that has the power to bring back lost wealth or Nasht Lakshmi! Lovely Neptune Green colored, perfect Cabochon with a mystical and Sharp silvery Chatoyant band, this noble and auspicious Chrysoberyl Cat’s Eye from Sri Lanka is a fine Sattvik gem with powerful Jyotish energies with powers to grant the best of both worlds! Set in a sterling silver ring with the ancient symbols of Ketu on its shanks and ready to deliver the best results of the South Node – Ketu! Selected Rings, Pendants and Talismans made available to Gemstoneuniverse.com patrons in April – May 2011. Comments Smooth surface with a wonderful translucence and a White body with cream overtones! 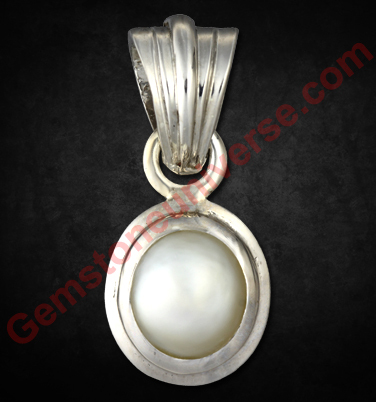 A fully natural and non-nucleated Pearl from Australia that is brimming with Sattvik energies and Jyotish powers of the planet of the mind – Moon! Calmly and serenely poised to harness the Serene and calm powers of Moon when set in this Sterling silver pendant! Comments Heliodor is also called as Golden Beryl! Legend has it that Heliodor is the stone of compassion, which helps the wearer be more sympathetic towards others, and also improves intuition! The name Heliodor is derived from Greek and means Gift of the Sun, because of its beautiful Yellow Color!Apart from being all of the above it is also the superior alternate gemstone for the planet Jupiter! 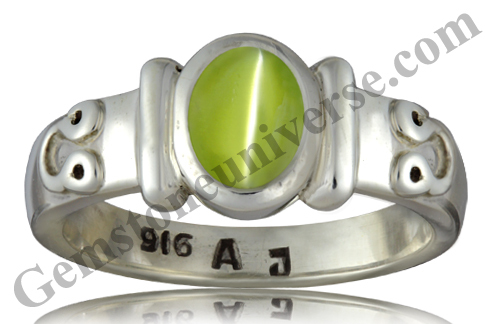 This gem when set in this sterling silver ring is set to deliver the best of the Jupiter energies!Note: The above links generally exist on the website for a period of 40 days after which they are periodically deleted to make way for new gemstones and to enable faster browsing. Comments Jupiter is the 5th planet from the Sun and the largest within the Solar system! Jupiter is 2.5 times the mass of all the other planets in our solar system put together! 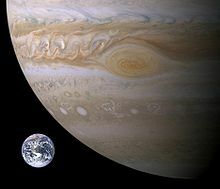 Jupiter’s volume is equal to 1321 Earths! It is also visible to the naked eye in the nighttime and occasionally even during the day when the Sun is low! 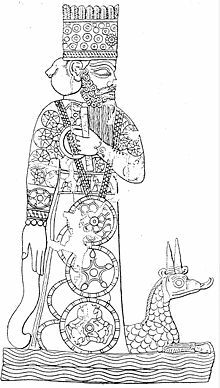 Ancient Babylonians, during the Hammurabi period, considered Jupiter as their God Marduk! The Romans named it Jupiter after their principal God! Jupiter’s day is Thursday, which is derived from Thor’s day, from Germanic Mythology, and Thor is associated with Jupiter! 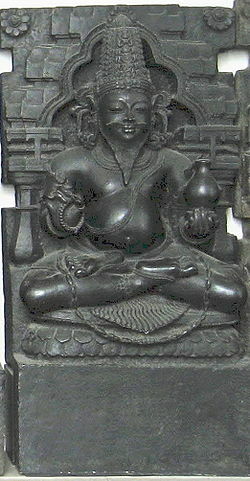 In Vedic astrology Guru or Brihaspati, is considered the most benefic planet and also the most benevolent one! Thursday is known as Guruvaar! He is also the teacher or Guru to the Devas! This magnificently Golden colored fully natural and untreated Ceylon Yellow Sapphire embodies the finest and abundant Jyotish qualities to be blessed with the magnitude of blessings that the Sattvik Jupiter showers! 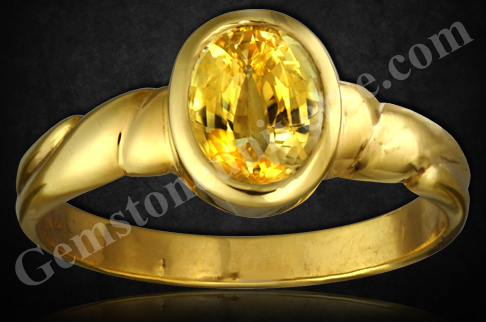 Has made a powerful talisman when set in this 22k Gold ring! Comments The purity of color it the most striking aspect of this fully natural and non-nucleated Australian Pearl! With endearing translucence and a smooth satiny surface this is filled with the Sattvik energies of the planet that rules the mind – Moon! 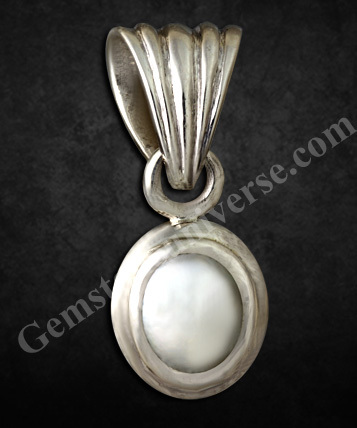 Sure to harness the Serene and calm powers of Moon when set in this Sterling silver pendant! A Heart warming unheated Talisman handcrafted with love and dedication. This customised talisman – the Amor del Sol, has been specially designed and handcrafted on request for a connoisseur of gemstones, a longstanding patron of gemstone universe. The centrepiece is a beautiful, natural, unheated, eye clean, loupe clean dainty heart shaped ruby of Burmese origin with an exceptional clarity with the exact Imperial Pigeon Blood Red Color. This discerning patron decided to wait till the desired colour stone could be procured. That we did, and the result was this stunning pendant in 22 carat gold with these Imperial, pigeon blood color lovelies! The heart shaped stone sits well-ensconced inside the gold circle, symbolic of the Sun. Ruby, is of course, the gem of the Sun. 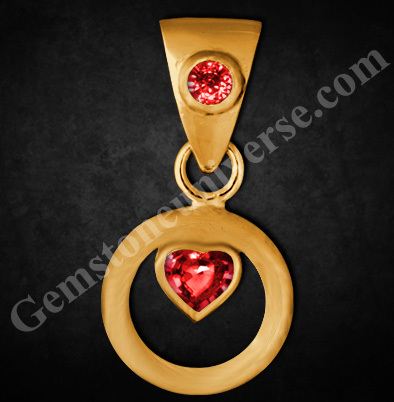 The pendant bail sets the talisman apart by holding another super lustrous ruby of Burmese origin and bringing out the resplendent sun energy in a unique and aesthetic way. Treatment: None. Natural, unheated. Eye clean. Loupe clean. The ruby is a fine gem that lends itself to crafting of some exceptional jewellery pieces. The Amor del Sol is a fine example where it is not just a delightful piece to own, but a highly powerful and symbolic one at that. Ruby has been a stone that has been favoured by the who’s who in world. The aura of power, royalty and strength that is subtly exuded by this lush gemstone is exceptional. The ruby has always been a hit with Indian royalty. The sun is known as the king of planets and is a significator of royalty and dominion. 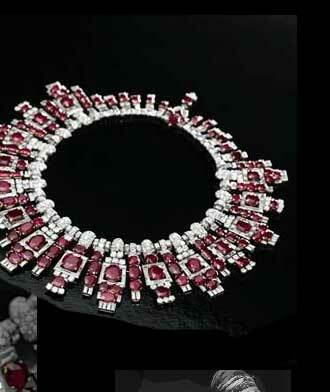 Feast your eyes on this dazzling ruby and diamond Cartier necklace commissioned by the Maharaja Digvijaysinhji of Nawanagar in 1937. Almost eight decades later, it remains a stunner. No wonder the celebs across the world love their’s. Eva Longoria, can be seen sporting ruby chandelier earrings at a big event. It is quite interesting that you will find the beautiful Hollywood actress Scarlett Johansson, sporting red. True to her name…and that is why we also find her sporting this big rock – a stunning ruby. Although, we are quite tempted to pass on the message – Scarlett, dahhling! Please, never ever wear a ruby in the middle finger (It is the finger for Saturn’s gem). The ring finger is the place for a ruby! So if you are looking for a protective, personal power enhancing talisman or a gift of love or simply a tastefully done piece of jewellery, the ruby it is! Thank You dear Patron for your gracious comments. They are as heart warming as the Amor del sol itself. Comments Rahu or the North Node is the head of the demonic snake that swallows the Sun or the Moon causing eclipses, it is believed! Rahu is believed in Vedic astrology to be the cause of chaos in the area of life that he controls! 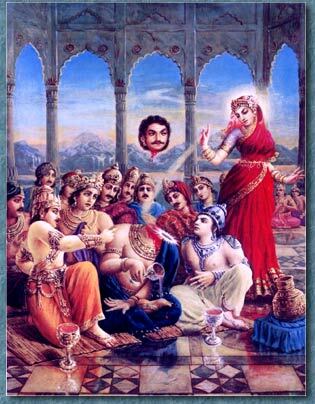 According to legend, Rahu drank some of the nectar that the Gods harvested during the churning of the Ocean, known as Samudra Manthan, but before he could swallow it, Lord Vishnu in his avatar of Mohini, cut off his head! 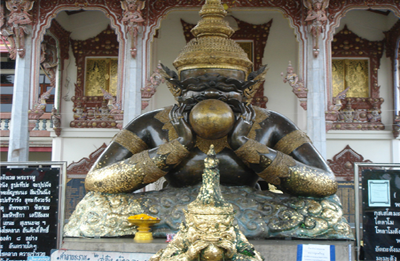 However the head is immortal and signifies Rahu! It is this head that swallow the Sun or the Moon and causes eclipses, which pass when they pass through the opening in the neck! With such powers and legends associated with the Shadowy planet Rahu, one can only imagine the mysterious powers it possesses! 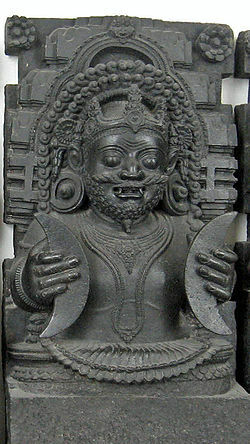 Rahu is said to be most powerful from Sunset to sunrise, and because he lacks power during the daytime, it is said that he cursed the daytime and imposed a time frame during each day, during which no auspicious work can begin! Each day of the weak has a different time and this time last for about one and a half hours! This is the time we know as the RAHU KAAL! 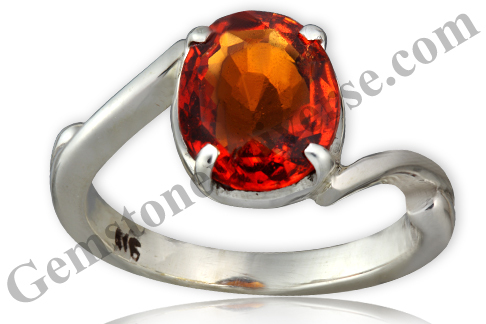 To harness the best of its mysterious powers and to keep the chaos it is known to create at bay, this one is a powerful, Sattvik, fully natural and untreated Ceylon Hessonite all ready to deliver the best results of Rahu when set in this sterling silver ring! 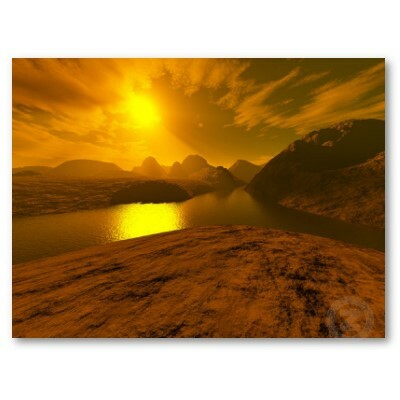 Seen a River of Gold? We Just did-Come witness a river of Yellow Sapphires that are flawless with a color so fine that it blinds the eye. New Lot of Flawless Yellow Sapphires for Gemstoneuniverse patrons!. To feel the energy is something intangible and cannot be explained but to see Energy in front of one’s own eyes, energy that blinds you and leaves you delighted is even more unexplainable. Come witness a river of Gold in these unheated Ceylon Yellow Sapphires from the famed gem fields of Ratnapura-Sri Lanka. Each of these natural Sapphires represents the best of Gem Quality and top of Jyotish Quality. Rich Butter Yellow Color which in accurate Gemmological term is classified as Rich Canary Yellow. Brilliant rich color, eye clean clarity, electric lustre, symmetrical beautiful cut and being fully natural with no treatment takes these miracles of nature at the top of the Gem Pyramid. 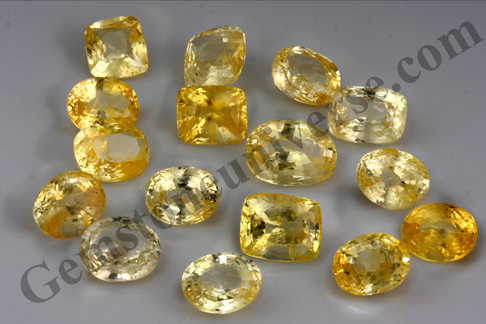 Each of these Yellow Sapphires represents the best of Jupiter Energies and will deliver the best results the pure, knowledgeable Dev Guru Brihaspati has to offer. Lot Name Golden River 2011 after the brilliant pure color that is rich, luxurious, lustrous and splendid. Absolutely the best! Fortunately this Golden river is not in a fairy tale. Its for real and its in front of you. Delighting News- Massive Lot of Unheated Yellow Sapphires for Gemstoneuniverse patrons and fans of Planetary Gem Therapy! We will ensure that Correct Gem therapy reaches even the remotest of Villages! Delighting News- Massive Lot of Unheated Yellow Sapphires for Gemstoneuniverse patrons and fans of Planetary Gem Therapy! We will ensure that Correct Planetary Gem therapy reaches even the remotest of Villages! Trust us to delight you with good news which is both substantial and tangible. Here is our new lot of Unheated Ceylon Sapphires- The pure and divine Gem of Lord Jupiter. Weighing in at massive 77+ carats according to our grading is Entry Level Jyotish Quality. – Gemstone should be fully treatment free and earth mined. The beauty of this lot is that it is all that and more. 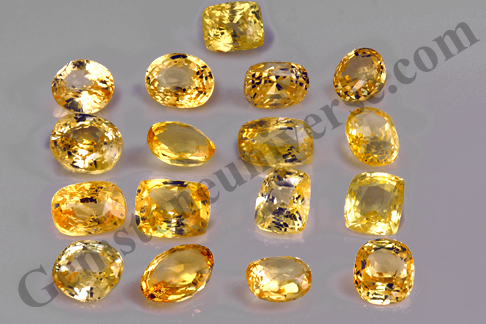 Each of these Yellow Sapphires from the Gem fields of Ratnapura-Sri Lanka is earth mined and fully natural. No heat or enhancement. The lowest carat weight Gem in this lot is 2.94 carats and the highest carat weight is 5.21 carats. 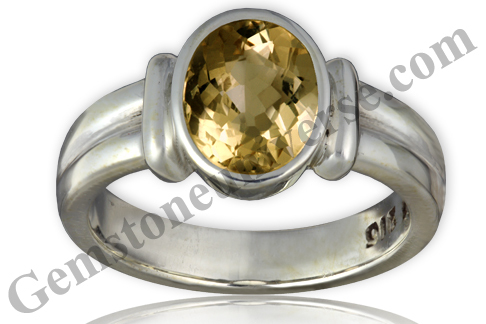 Yes you got it right 5.21 carats unheated Ceylon Yellow Sapphire with 90% clarity and above. 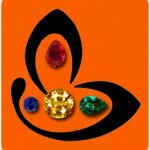 Average Lot size is around 4 carats for each gemstone. Price: We will make them available at a price that even the individual who is living in the most remote town/ village and who is truly inclined to implement Gem therapy gets them at a price that makes it possible. And yes, even they deserve a Jyotish Quality Gem and when we say we make you fine Gemstones available to you at 1/6th of the price we meant it! Lot Name: Swabhiman 2011. The word Swabhiman means self respect and dignity. This is the land of sacred Planetary Gemology- a science and an art that creates miracles and the individual who needs it most shall get it! A world class gemstone not a bluff rock that he/she is forced to buy! Certification and appraisal of this lot is complete and you shall have them in the online Yellow Sapphire inventory in the next 2 weeks. Our belief: Deo Amabiles Et Hominibus- Pleasing to God and to Men! The gem of the stern teacher and the Karmic Planet-Saturn! Electric Blue Lustre with fine color-Glorious Blue Sapphire. Decide whether it’s a Blue Sapphire or a Blue Diamond? 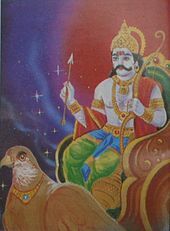 Comments The word Shani comes from Shanaye Kramati Sa, the one who moves slowly, as Saturn takes about 30 years to revolve around the Sun! Shani is a Deva and son of Surya (Sun God) and his wife Chayya (Shadow goddess) and hence also known as Chayyaputra! A favourably placed Shani in the horoscope of a person stands for a strong career, healthy life and everything positive for that person! 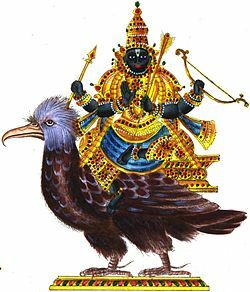 In fact, a well-placed Shani in one’s horoscope is something every astrology believing person hopes for, as no other graha/planet can bestow what a favourable Shani can! Shani is also a Karmic planet that gives results as per the Karma of the person! 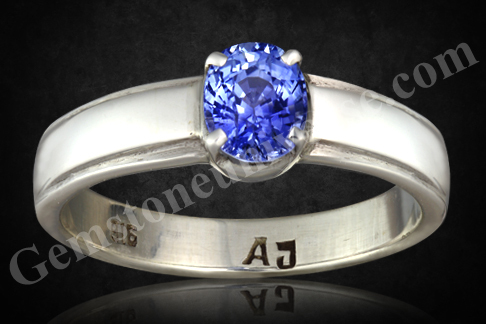 This Fully natural and untreated Ceylon Blue Sapphire has a beautiful Diamond Cut and the most alluring Kashmir Blue Color and a Sattvik and powerful aura to deliver the best blessing of the Lord Shani, and set in a beautiful sterling silver ring!